« Moving the car and having some fun with the lights. Below is a quick reference to where the LED`s and photocell need to be plugged into . 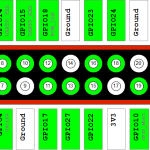 If you need any help in wiring up LED`s to the Pi the please have a look at Gordons Projects. A quick search on ebay and should find all the components you`ll need. I used a breadboard with a breakout connector so the Pi can be quickly plugged / unplugged . A little note for the wiring the long leg goes to the Pi pin the other to ground. The LED`s I choose are low power so adding a resistor to them left them very dim. Tagged LED`s, pi-car. Bookmark the permalink.